Disney World in late March is a dream come true---especially if you are between the ages of 5 and 7. Finally, I decided that my job as a mom was to indulge that dream. From the beginning, it seemed that this trip of a lifetime for my young daughter would be a test of endurance for me. My husband was staying home to work, so for the first part of the trip we would be on our own. However, we were excited that we would be meeting my sister and her family there. From the very beginning, the challenges were rampant. The plane did not depart until 10pm, with an arrival time after midnight. Upon arrival in Orlando, we were told that our hotel rooms were suddenly “oversold” and that we were being “upgraded” to a hotel about 7 miles further away from Disney World. When I got to the hotel, I had to forge a plan to compensate for the woefully inadequate shuttle service of the hotel. I immediately set up my 5-star coffee maker and made a quick pot of Colombian brew. Meanwhile, my 7-year-old pored blissfully over the map of the Disney World parks. It was 2 am in the morning, but I was energized and promptly called the desk demanding to be put on the shuttle schedule for the next morning. By 7am later that morning, we were up, showered, and dressed. We packed a bag of sundry items to deal with a day at Disney, including sun screen, hoodies, almonds and fruit snacks---and Starbucks Via, just in case. A freshly brewed cup of coffee helped me get us out the door, down to breakfast and onto the shuttle. It was a super long ride, so being early was critical. Breakfast was good indeed, and the carafe of coffee that the waitress brought to us led to an increase in tip. It was going to be a good day after all. Then the downpour started. We hurried and purchased ponchos and tried hard to keep on keeping on---with rides and character sightings---until we just could not endure the rain any longer. Back at the hotel, dinner came with coffee (very good coffee) and a bevy of tempting dessert options. We happily availed ourselves. There was another early morning in front of us, but we had a 5- and 7-year-old that were so hopped up on the magic of Disney that they would not even consider going to bed. It became a very, very late night. My sister and I were thrilled that the Starbucks in the lobby was open---in fact, we ordered skim cappuccinos for ourselves, which were foamy and lite and infused with just enough espresso to help us stay awake for all of the action that night. That action included jumping from the bed onto pillows on the floor, playing Webkinz, and channel surfing between Disney and PBS Kids. The next day, the very pinnacle of my coffee experience at Disney came at Epcot. After riding the Nemo ride and taking photos in front of flower sculptures of Goofy, we happened upon a little cafe-kiosk, with ice cream and lattes---lattes that could be made with skim milk. I ordered a vanilla latte. After taking the first heavenly sip, I knew I had to sit down on a bench and bask in the glow of this wonderful beverage. 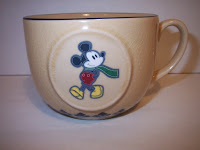 I love Disney World (ironically enough) and I still love, love, love coffee!